In India when someone has a cold, flu, infection, sore throat or body ache their mother’s or grandmother’s make “Kadha” at home. Kadha means herbal tea – it is a medicinal tea. Although today many herbal teas are available at health food stores, I can assure you this is a great homemade herbal tea replacement where you are only using your humble kitchen healers. 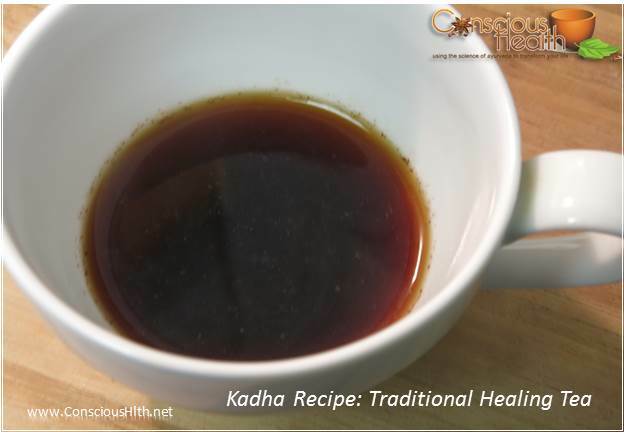 I am sharing with you my favourite Kadha Recipe A Traditional Healing Tea. Black Peppercorn: Pungent, healing and increases bile. When added to foods it helps digest and creates a good taste. It increases the absorption of the mineral Zinc. Bay Leaf: Encourages glucose metabolism. Cardamom Seeds: Seeds stimulate appetite, aids digestion and eliminates flatulence. This spice is also used for detoxification. Cinnamon: Assists in glucose and carbohydrate metabolism. It also improves circulation and provide relief from cramps. Cloves: A heating spice that opens up the body channels. It improves digestion, anti-microbial and used as oral anti-septic. Fennel: A cooling spice. It is used for digestive upsets, flatulence, cramps, nausea, low stomach acid and settling stomach pain while stimulating the appetite. Ginger: This pungent flavor spice is Tri-doshic. It improves digestion, absorption and assimilation of food. Ginger improves circulation and helps with congestion. Honey: It has a heating quality. Honey contains iron, phosphorus, calcium, sodium and potassium. Honey is great for our heart, throat, chest and blood. Holy Basil: Tulsi or Holy Basil is a tonic and an adaptogenic herb. It basically means that this is a transformative herb and, when taken daily, it moves a person towards health. Saffron: As a stimulant saffron increases the stomach fire or HCl. It relieves dry cough and headaches. Turmeric: Bitter and Astringent in taste it is used as anti-inflammatory and decongestant. It cleanses the liver and reduces pain in the body. 1. In a pot dry roast the whole spices – cloves, pepper, cardamom, fennel seeds, cinnamon and bay leaf for 2 minutes. 2. Pour water, add ginger and boil the spices in water. You can add the optional spices at this stage. 3. Add holy basil and simmer for 4-5 minutes. 4. Remove from the heat, strain and pour in a cup. Water should be reduced to half. 5. Add honey and ghee at this stage. Thanks for the recipe. I had tried Kadha once in the office canteen and ever since wanted to replicate it. Sandhya – half the dosage. Also too eating for small children to speak with doctor before using. Thanks for the recipe, i wanted to drink kadha but don’t know how to make. Now i have sore throat 4 to 5 every year. I will try now the khada. Will it cure sore throats. Imtiaz – did you already try? Also do black seed oil to keep your immunity strong. Thanks for sharing the recipe. The blog was really informative and worth sharing as it is for a noble cause of helping people, long-suffering from a sore throat and cough problems.